Hostile Bunni has been pretty quiet lately, so i decided to see what he’s been up to. Remember that ‘duplicating’ machine in the movie Santa Clause 2? Well, looks like bunni had the same idea. It’s red cause it’s evil. 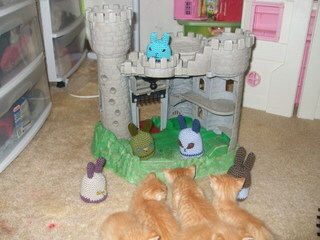 The arrival of the new kitties fueled his desire for a hostile takeover~ bunni style. Phew, looks like the kittens got lucky this time!! At this point, i finished off and sewed the body shut. After stuffing it, of course! 1. I made the ears first, then sewed them on the head before i got to the first decrease round. 2. For the faces, i cut out circle and almond type shapes for the eyes, and rounded triangles for the noses. I used black embroidery floss (3 strands) to sew it onto the head, also, when i was done sewing on the nose, i put the needle through the spot right under the nose, went back in just a little bit down and then embroidered a kinda wide upside down ‘V’ for the mouth. 3. i did a color change in the third to last even sc round. thank you for sharing pattern too. I must make evil bunnies, and give them to all my friends! They are so evil. I love them. 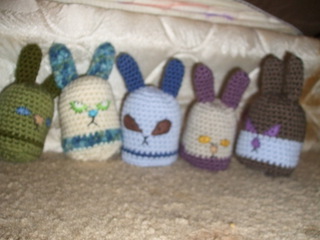 Cant wait to get back into amigurumi this year. Bestest, original easter gift to give to non-kids. Parents would get a kick out of these because of their adorable evilness. Muahahahaha!!! Thank you for sharing! Phew! I was worried about the kitties for a minute! Looks like Mama saved them. Also, it looks like you’re having more fun with that castle than the kids ever did! 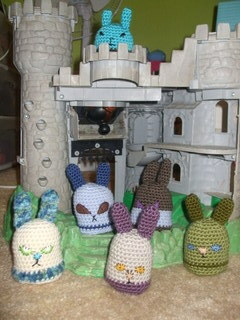 I am in the process of making Hostile Bunni & minions to tackle the 3 Westies that own this house. 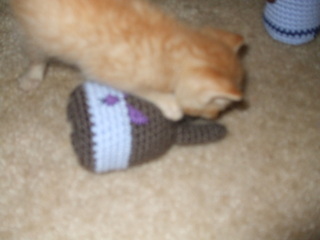 Nathalie must post more adventures of minions & kittens. Now. We won’t tell the minions how cute they are! LOL! I love this post! Too funny! and the bunnies are great. thank you so much for the pattern. i am definitely going to try these! Hey! Did you disappear off the face of the earth again?? No!! More like i had to wait for payday to get my internet turned on….again!!! LOLZ!! Favorite bits: night-vision bunnis, “We have you surrounded!” “Bunny down!” Thanks for sharing the mayhem. Thank you everyone!! I have so much fun with the kitties and the bunnies!!!! I will continue the bunni saga soon!!! 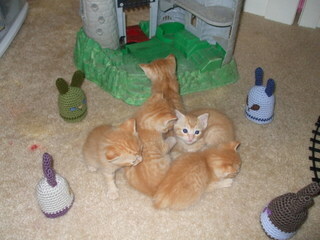 Oh I just love the bunnies and the gorgeous ginger kitties! 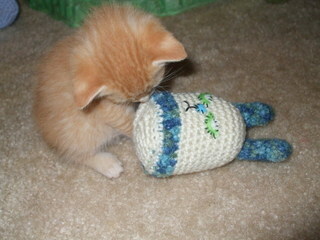 I shall have to make one for Tinker my ginger tabby and stuff it with catnip. He will adore it. Thank you for sharing the pattern. Thank you, Susie! If you make one, please send me a photo with it and your cat!!!!!! I love it! 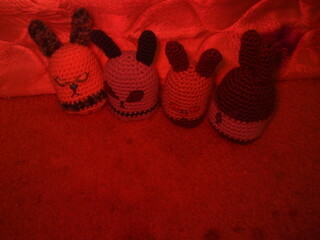 My evil bunni is the first amigurumi I’ve made, and it was so easy and adorable? I think I will make some minions and attack my Shih-Tsu… MHUAHAHAHAHAHA!!!!!!! 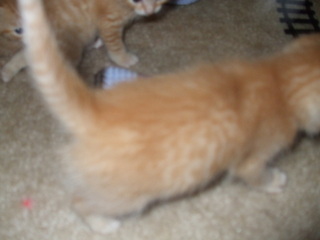 Can I have two orange kitties? JK, but they are soooo cute! The evil minions are adorable– thanks for sharing the pattern. 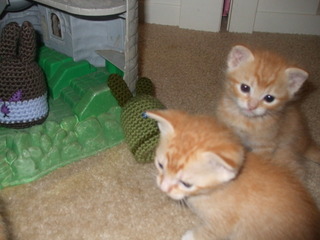 The kittens are adorable too!!! 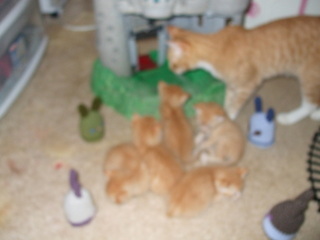 Takes me back many years when we had litters of kittens. My cat Cleo had litters- 3 times a year- and always a large ##- usually 6.Talk about fun and craziness! and yes we always found homes for them. I’m going to make an absolute million of these little guys! Thanks for sharing the pattern, I’ve been making pumpkins for a week and needed something new. fess up, was there catnip in them bunnies???? nope!! i think the cats could sense the evilness of the minions!!! This is great! I want to join! Hahaha! The story is too cute! I can’t wait to make my own evil minions. Happy Halloween to you. LOVE your pictures! The perfect center piece: a pile of kittens! Of course, your minions are awfully cute in a dastardly sort of way.